These guys have been flitting about my backyard for the last week. They're quite bold. I swear that a few have deliberately swooped on to the fence or lower bowers of the hackberry trees just to get a better look at me. It took me a bit to identify what they were, as what I am seeing are most likely first year birds and adults in their drab non-breeding plumage. The telltale sign was the bright yellow patch on their rumps. As far as I know, these are the only wood-warbler species in the Eastern US that sport this feature. The trees have been full of their 'chek, chek, chek' calls as they forage for arthropods and other invertebrates. I see them foraging on the ground a lot, too. There's a reason that I have them filling up my yard. They migrate down from their coniferous breeding habitats up north in massive numbers. They are one the most numerous North American warbler species, and while their breeding habitat is pretty specific, they are more general in their foraging habitat needs. Hence, my hackberry treed, scrubby backyard suits them just fine. Anyway, I was inspired to make a bird painting; something I haven't been able to do for a while. 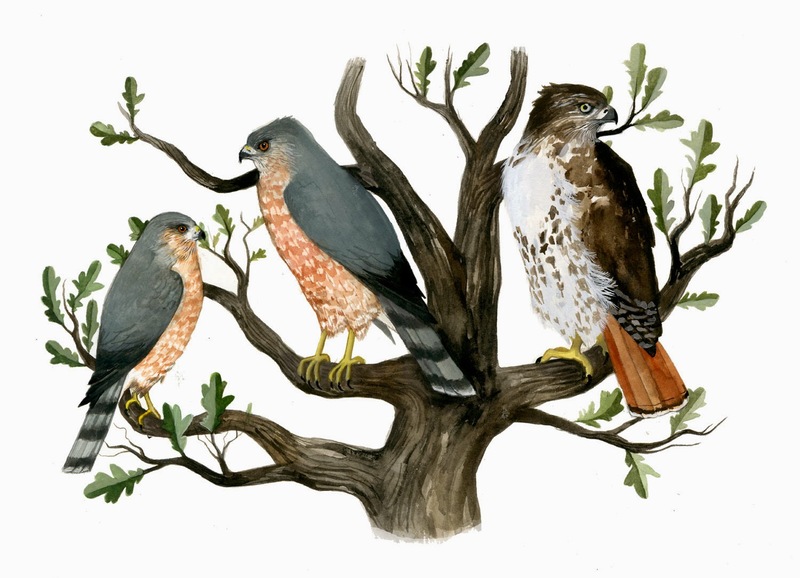 Notice that on my painting I have the scientific name as Dendroica coronata. After completing that part of the painting, I did some research. As a result, I just learned that all species formally placed in the Dendroica family are now being classified as Setophaga due to DNA work. I don't think this is that recent of a change, but for some reason I had forgotten about it. That might have something to do with owning a very old Sibley Guide. Thanks so much, Julie! Yes, we have quite a few goldfinches as well. I put a 'prairie patch' in our yard, and this time of year they descend and devour all the flower seed heads. I love the different personalities of our backyard bird (blue jays: "hey lady, when we pass by we expect food to be in the dish"; cardinals: "if it's not too much trouble, madam, a few seeds would be lovely"; they're all different) We have goldfinches too. They are shy and skittish. I have the niger feeder near the back door so I can watch them from inside without spooking them. 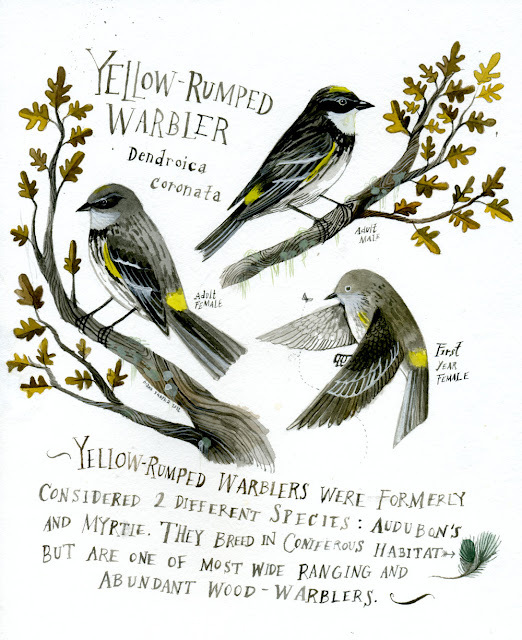 I like your description the warblers (and your painting). I'm going to look them up and see if they are here too. I think we have curious but skittish bushtits in my backyard. They are too skittish to pose for photos or portraiture but I'm pretty sure they're not wrens or sparrows. Your paintings are lovely - can't wait to see more! Laurie, I'm pretty sure I have probably called them 'yellow butts' too. In fact, I prefer that name. They're so beautiful in springtime!